In the first three months of 2016, Indonesian authorities continue to react repressively to developments surrounding the United Liberation Movement for West Papua (ULMWP), a Papuan civil society coalition advocating self-determination and a representative to the West Papuan people to the Melanesian Spearhead Group (MSG). While cases of treason have considerably decreased in 2015, hopes of the cessation of this controversial law may be dashed by an ongoing investigation into seven prominent civil society members following a ULMWP event in Wamena, Jayawijaya regency. The sentencing of four soldiers and two police officers in two separate brutality incidents that took place last year is a step in the right direction for state accountability in Papua. However, the light sentences received by the perpetrators showed that punishment received by security officers served merely as a slap on the wrist rather than meaningful punishment intended to secure justice for victims. The light sentences received by officers, particularly the 18-months’ sentences each for two Jayapura city officers found guilty of openly committing violence, sends a wrong message in the face of continual abuses. The refusal of a visa permit to a French journalist following his documentary on West Papua throws President Jokowi’s previous promises of media freedom in Papua into serious question. Increasing international awareness and interest on West Papua – as is reflected in concerns raised by the Solomon Islands at the UN Human Rights Council in March – will likely place increasing pressure on the Indonesian government to address historic and ongoing human rights abuses in West Papua. Reports from Wamena-based civil society groups stated that seven people were questioned by police in relation to the opening of a United Liberation Movement for West Papua (ULMWP) office in Wamena. The building, which was built in the style of the customary honai, is also the new office site for the Wamena Papuan Customary Council (Dewan Adat Papua, DAP). The event, which took place on 15 February, was attended by hundreds of local community members in Wamena. A prayer session was held to mark the event, led by Father John Djonga, a Catholic priest and well-known local figure. Father John Djonga also led a ceremonial blessing ritual of the office building. An address by ULMWP leader Oktovianus Mote was read out by Markus Haluk, a member of the ULMWP Internal Affairs Working Team. A speech was also given by Dominukus Surabut, a local Papuan Customary Council (Dewan Adat Papua, DAP) leader and ex-political prisoner. In his speech, Surabut spoke about the Indonesian Government’s failure to fulfill, respect and guarantee the rights of indigenous Papuans. The event also saw the erection of a ULMWP sign in front of the office building. According to local human rights sources, Jayawijaya intelligence officers (Kasat Intel Polres Jayawijaya) were briefly present to observe the event’s activities but did not make any arrests that day. The following day, on 16 February, the Head of Jayawaijaya Regional Police (Kapolres Jayawijaya) and the Military District Commander of Unit 1702 (Dandim 1702 Jayawijaya) arrived at the ULMWP office site and forcibly removed the ULMWP sign in front of the building. Authorities reportedly explained to DAP elders that they had done so as the ULMWP was a banned organisation whose principles were opposed to the principles of Pancasila and warned them against activities that were in conflict with the State. (“merupakan organisasi terlarang yang asasnya berbeda dengan Pancasila sehingga Kapolres dan Dandim melarang mereka melakukan kegiatan-kegiatan yang bertentangan dengan Negara.”) Authorities reportedly seized the ULMWP sign as evidence, and also stated that the speeches conducted the day before would be used as evidence in court as it allegedly contained statements that were in conflict with the principles of Indonesian State. Shortly after, Jayawijaya police issued summonses to seven people who were involved in the opening of the DAP/ULMWP office. They were Father John Djonga, Dominikus Sorabut, Enjel Sorabut, Piter Wanimbo, Boni Mulait, Yesaya Dimara and Dr Gunawan. All seven men were summoned to be interrogated as witnesses to the opening of the DAP/ULMWP office, which police deemed as a case of treason. In the summonses, no single individual was accused with treason. According to lawyers with the Democracy Alliance of Papua (Aliansi Demokrasi untuk Papua, AlDP), four of the seven men have already been questioned by police – Father John Djonga, Enjel Sorabut, Piter Wanimbo and Boni Mulait. Police reportedly questioned them regarding the opening of the office building and the ULMWP. It is understood that the seven men continue to face calls to be questioned, reportedly in relation to activities of 15 February, which continue to be regarded as a case of treason. However it remains uncertain if any of the seven men will face criminal charges. On 20 January 2016, Yusanur Wenda was released on parole. 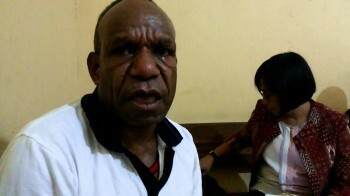 On 20 January 2005, Wenda was arrested under accusations of arson and being a member of the Free Papua Movement (Organisasi Papua Merdeka, OPM). He was sentenced to 17 years’ imprisonment. Papuan civil society members have long argued that Wenda is an ordinary civilian and not an OPM fighter. Human rights lawyers confirmed that four soldiers from Military District Command 1710 (Komando Distrik Militer 1710, Kodim 1710) involved in the killing of two young Papuan men in Timika have been sentenced to imprisonment. On 28 August, Imanuel Marimau and Yulianus Okare, both 23 years old, were shot dead and at least five others suffered injuries when solders opened fire on a group of people in Koperapoka in Mimika Regency. Two of the soldiers were reportedly drunk when they interrupted a traditional ritual held in a church courtyard by members of the Kamoro tribe in Timika in honour of a local man who had received a doctorate degree. During a military court trial, Chief Sergeant Makher Mathijs Rehatta was found guilty of manslaughter and severe maltreatment under Articles 338 and 351 of the Indonesian Criminal Code and sentenced to 12 years imprisonment. Chief Private Gregorius Bernadus Geta was found guilty of aiding manslaughter and aiding maltreatment under Articles 56, 338 and 351 and sentenced to three years imprisonment. First Sergeant Ashar was found guilty of maltreatment under Articles 351 and sentenced to nine years imprisonment. First Private Imanuel Imbiri was found guilty of the unlawful use of sharp weapons under Emergency Law 12/1951 and sentenced to three years imprisonment. All four men were expelled from military service. On 20 January, Chief Brigadier Suherman and Brigadier Dimanik of Jayapura City police were found guilty of openly committing violence under Article 170 of the Indonesian Criminal Code and were each sentenced to 18 months’ imprisonment. On 28 August 2015, the two police officers kidnapped and tortured three Papuan men – Elieser Awom, Soleman Yom and Yafet Awom. The three men were accused of stealing a motorcycle and were told that they were to be interrogated at a police station. Papuan newspaper Tabloid Jubi reported that a public forum organised by the ULMWP was cancelled due to police presence at the venue. On 12 March, police officers blocked the forum from taking place at a student dormitory in Mimika. The forum, which was co-organised by the ULMWP Internal Affairs working team and the Central Executive Board of the Indonesia-Highland Student Association (DPP-AMPTPI), intended to discuss latest developments and the current situation in Papua, including the events that took place following the opening of the ULMWP office in Wamena, Jayawijaya Regency. Police reportedly blocked participants from entering the room where the forum was meant to take place. Plainclothes police officers were also guarding the area surrounding the student dormitory. Upon seeing the heavy police presence at the venue, the organisers then decided to cancel the public forum. In early January, French journalist Cyril Payen was reportedly denied a visa request to visit Indonesia following a documentary he made about West Papua last year. In mid-2015, after obtaining the necessary visa requirements, Payen visited Indonesia and produced a documentary entitled “Forgotten War of the Papuans.” The documentary was broadcast on 18 October on France 24 and reportedly resulted in the French ambassador in Jakarta being summoned by the Indonesian Foreign Ministry. International press freedom watchdog Reporters Without Borders (RSF) condemned Indonesia’s refusal to let Payen visit and urged President Jokowi to keep his promise of opening West Papua to foreign journalists. On 15 March, the Solomon Islands raised concerns regarding ongoing human rights violations in West Papua at the 31st regular session of the UN Human Rights Council in Geneva. Minister Counseller and Chargé d’Affaires of the Solomon Islands Mission the UN and the WTO in Geneva, Mr Barrett Salato stated concerns regarding violence perpetrated by Indonesian security forces. He stated that such violence showed “a strong pattern of racial discrimination that disadvantages indigenous Melanesian Papuans in their own land.” The Solomon Islands urged Indonesia to facilitate access to West Papua for the UN Special Procedures, in particular the Mandates on Freedom of Expression, Association and Assembly and to allow for a human rights fact-finding mission to West Papua.